Lately I have been seeing a lot of the celebs wearing these fabulous Rag& Bone Prix Leather Panel Jeans. The latest look and Glam Bombshell Ms. Angela Simmons was spotted wearing these fabulous jeans while doing some shopping at Saks Avenue in Beverly Hills. The fabulous Bombshell was sporting these $255 rag& bone pants with a nice pink sheer top and a nice leather jacket. Mrs. Toya Wright adding a nice blue to make it pop of color. I am in love with Ms. 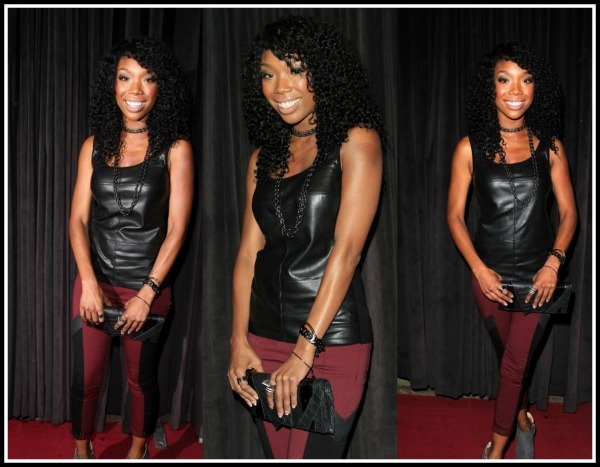 Brandy's look with these Burgundy Rag& Bone Leather Panel Midrise Skinny Pants with a nice B44 Leather Jersey Tank. Her look just might be my favorite and the colors are great for Fall/Winter.